2. The historical definition has changed: "A lintel is a decorative moulding used as an added accent above doors, windows and fireplaces. Add lintels to stock boards for a distinctive look." is an Internet ad in September 2018. Found on almost all types of architecture. Essential element in post-and-lintel support system. Found over portals, doors, windows and fireplaces. 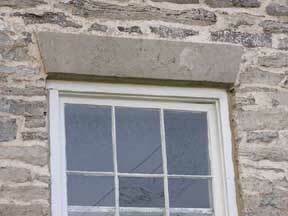 Splayed lintel: A horizontal lintel above a window or doorway which slants downward toward the centerline; often containing a keystone at its center. Lintels are structural elements that allow to create the openings in masonry walls. In the past the width of wall openings was limited to the length of available materials, as seen in the example of single-stone lintels. The invention of masonry arch allowed to extend the span of used lintels. The properties of arch lintels were studied mostly by the Romans. However, the invention was not made by them. The first arch lintels were created by ancient Greeks around 1st century B.C. The longest lintels found in Greece were 6 m in span. Development of technique and knowledge allowed Romans to extended the span up to 40 m. Invention of arch lintels allowed to introduce elements that carry compressive stresses reducing the influence of tensile stresses. Openings for doors, windows or cupboards etc, must be bridged over by some means to support the masonry above. The support to the load above the opening is usually given by providing an arch or a lintel. Lintel acts like a beam and transfers the vertically to the supporting walls. The end of lintel are built into the masonry so as to convey the weight carried by them to the masonry in jambs. The amount of bearing which the supports provide for the ends of lintel is an important factor.